“The impact of immigration on the lives of women and children is rarely discussed,” said Radcliffe Dean Lizabeth Cohen as she opened the “Crossing Borders: Immigration and Gender in the Americas” conference last Thursday. Day one of the conference began with a concert by Quetzal, a Grammy Award-winning rock band from East Los Angeles whose music takes up the social and political stories of struggling people; singer Martha Gonzalez participated in the opening night panel discussion. The conference tackled transnational identity, reproductive law, and the influence and impact of American society on immigrant children. 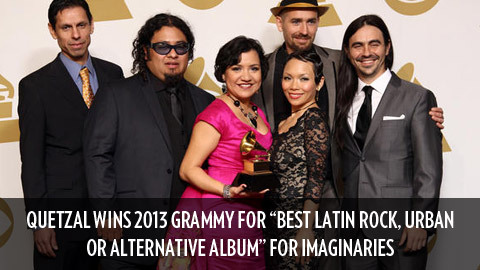 Quetzal, the L.A. band that weaves together funk, rock and regional Mexican folk-music varietals such as son jarocho, has won the Grammy for Latin rock, urban or alternative album. Quetzal won for its release “Imaginaries” (Smithsonian Folkways Recordings), a characteristically ambitious foray into cumbia, neo-’80s-style R&B, Cuban charanga and Brazilian pandeiro, charged with the band’s collectivist political passion. It is the band’s first Grammy. Quetzal was one of a number of L.A. bands to emerge from the cultural trial-by-fire of L.A.’s 1992 riots, along with such other Chicano fusionists as Ozomatli, Lysa Flores and Aztlan Underground.